"Where the railroad and civilization ended, the Sante Fe Trail began!" Only remotely connected with its title, this American western film classic stars Errol Flynn and Olivia de Havailland, and includes Ronald Regan playing George Custer. The film focuses on John Brown and his abolitionist movement before the Civil War. Flynn and Regan are assigned to Ft. Leavenworth, the most dangerous post in the country. They meet the man building the railroad to Santa Fe, along with his daughter. Both fall in love with her. 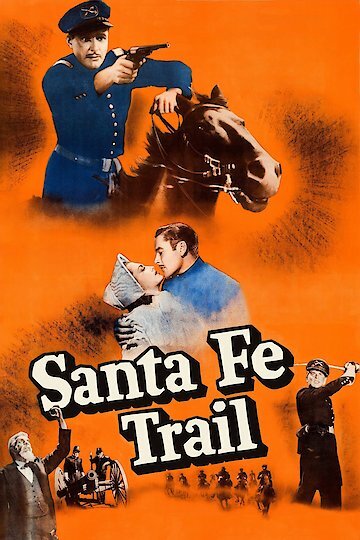 Santa Fe Trail is currently available to watch free on Tubi TV, The Roku Channel and stream, download, buy on demand at Amazon Prime, FlixFling, FlixFling VOD, Vudu, Google Play, iTunes, YouTube VOD online.